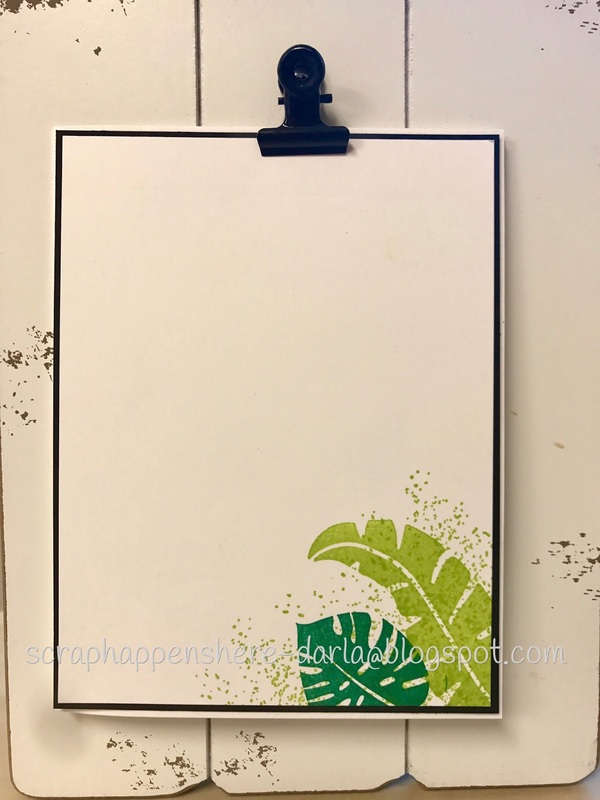 Scrap Happens Here with Darla: Pop of Paradise! Good morning! It's a beautiful morning...I'm up early and ready to go! I'm working today and have to be there at 7:30am! I'll be there ALL DAY...so no time to create...boohoo!!! I love getting out into my workshop even if it's only for an hour...maybe after dinner! I'd like to share another card that we made at my July classes. It's FUN and and BRIGHT colors can be used for ANY OCCASION! I LOVE this card! My card base is Whisper White and the first layer is Basic Black. Next I stamped my background on Whisper White card stock with the Pop of Paradise stamp set. The long fronds are stamped with Lemon Lime Twist ink and the shorter fronds are stamped with Emerald Envy Ink. I used my Touches of Texture stamp set for the speckled effect because it just seemed to white where in the empty spaces! I used my Large Layering Ovals framelits to cut the scalloped oval in Basic Black. I cut the largest stitched oval (from the Stitched Shapes framelits) in Whisper White and used my Pop of Paradise stamp set to stamp my flamingo! 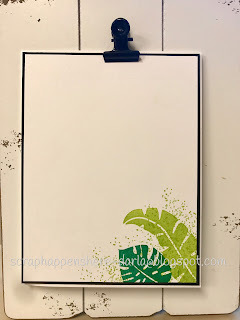 I used my Basic Black and Flirty Flamingo Stampin' Write markers to color the flamingo! I sponged the sky with Pool Party ink. The water is stamped with the Fabulous Flamingo stamp set in Bermuda Bay. I used a dobber to add a lighter version of Bermuda Bay! Last I added some Basic Black Solid Baker's Twine! Here's the inside of the card! It is stamped just like the background on the front of the card, but only in one corner! That would be SUPER CUTE stamped on an envelope too! I need to start including envelopes...then my gals will have all that they need to send their cards...well...minus the stamp! This is such a CHEERY card! I think I'll use it for a church birthday card! One down and just a few to go! Funny...July had TWENTY birthdays and August has FOUR! I'm hoping I can get ahead of things! Well...that's it for today! THANKS SO MUCH for stopping by to see what's been happening in my world! 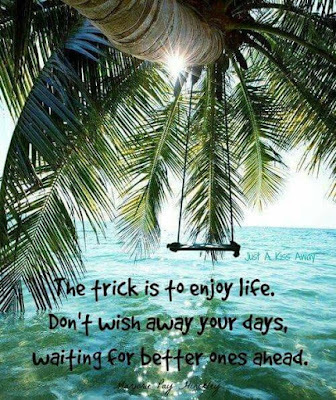 Have a TERRIFIC DAY! !